New Climax Heroes Fourze Reveals: Wait, there’s more? Kamen Rider Fourze Elec States have access to the other switches too. In the trailer, we saw a narration when Amazon did his Daisetsudan explaining the attack. This will be in the game for the Showa Characters specials. Jōji Nakata (OOO Narrator) and Nobuyuki Hiyama (Fourze Narrator) will be doing the voice for the narration parts, you will be able to choose one of them but having it is completely optional. There are still characters that were not revealed and we need to look forward to them. You always have Rocket, Drill, Launcher and Radar and you choose four other switches, one for each limb, before battle. Fourze Fire States is pretty much confirmed. On Elec’s section it says that Fourze also has another/other state change and there is one more ??? box in that section for something Fourze specific. Wow, this is a suprisingly big game. Where will they find room for all of those things AND a host of unrevealed new characters? We’ll just have to wait to see what they come up with. BTW, Which narrator would you prefer to listen to in the game? Author M.F. CalhounPosted on November 9, 2011 November 9, 2011 Categories MC's postsTags Astro Switches, info, Kamen Rider Climax Heroes Fourze, Kamen Rider Fourze, Namco Bandai, narrators, new riders, new states, newsLeave a comment on New Climax Heroes Fourze Reveals: Wait, there’s more? Climax Heroes Fourze New Finishers Announced: Breaking the Limits of Gameplay! Hey, the recent issue of Dengeki Magazine revealed aome new info on the upcoming game Kamen Rider Climax Heroes Fourze. This new info deals with new Switches for Fourze, Elek State playability, and new finishers for old characters. How many more ways can they make this game even more EPIC?! Rocket: Uses the rocket’s jet propulsion to fly across the screen towards the opponent and punch him. Launcher: Shoots missiles. If you use it together with Radar, the missiles gain homing properties. Hopping: Makes moving around difficult. Drill: Drastically improves kick power and lets you use a special in-game kick with Fourze. The other four Switches, Radar, Magic Hand, Camera, and Chainsaw, have so far only been seen in the CGI Artwork. Currently, there’s no word on any other “unfinished” characters getting new finishers. Kamen Rider Climax Heroes Fourze will be released this December for the PSP and Wii for 5981 yen. Author M.F. CalhounPosted on October 26, 2011 October 26, 2011 Categories MC's postsTags Astro Switches, Dengeki Magazine, Elek State, info, Kamen Rider Climax Heroes Fourze, Kamen Rider Fourze, new finishers, newsLeave a comment on Climax Heroes Fourze New Finishers Announced: Breaking the Limits of Gameplay! In this set, we see OOO using ShaUTa and TaJaDoru against various opponents. With these two, OOO has several projectile attacks available. And he has finishers for all of his Combos, such as the TaJaDoru final attack “Prominence Drop” shown above. Featured here, we have the two strongest Combos available to OOO, the PuToTyra and BuraKaWani Combos. We can see BuraKaWani using his finisher “Warning Ride”, and PuToTyra is using the ever popular Tail Whip (which is [effective]). Now we come to Kamen Rider Birth, who has full access to his BirthDay form, as well as his individual armaments. And OOO has to steal the spotlight again, this time with three of his Combos, GataKiriBa, RaToraTa, and SaGoZo. And finally we have these screenshots showing the new tag-team system, with the two Births fighiting Ichigo, and OOO and Birth teaming up to take down W. Depending on which characters are paired together, there will be special team-up combos and finishers. Kamen Rider Climax Heroes Fourze will be released for the PSP and Wii in December for 5981 yen. Climaz Heroes Fourze Update: Abilities make games that much more fun! Ichigo has the ability to take his opponent skills. Nigo blasts and shock waves have a wide range. V3 is Orange Gauge, he can summon Riderman that will do his Rope Arm attack. Amazon seem to have a super jump (Condor Jump). BLACK and Shadowmoon have long range light attacks. Shadowmoon can use his Satan Saber. RX is a Red Gauged, he can change to the powerful but slow Roborider, or the quick Biorider. Faiz can now use the Crimson Smash as a finisher. The game will be released at the start of December, for both the PSP and the Wii, for 5981 yen each. Author M.F. CalhounPosted on October 18, 2011 October 18, 2011 Categories MC's postsTags abilities, announcement, Kamen Rider Climax Heroes Fourze, Kamen Rider Fourze, updateLeave a comment on Climaz Heroes Fourze Update: Abilities make games that much more fun! Kamen Rider Fourze Super MEGA post: Launching Story Barrage in 3,…2,…1! Hey, a bunch of new stories and rumors have come out for Kamen Rider Fourze over the last few days, and unfortunately I haven’t been able to keep up with the ever-growing number. So I’ve decided to just throw everything into one mega-post, starting from oldest to newest. So let’s get to it! Amanogawa High School wins the District Tournament. Daimonji’s father congratulates him. The cheering team also comes out to cheer. However, Daimonji is searching for Miu. He phones her, Miu says that she is busy with other club activities. At the background you can hear the sound “Spike ON,” and Miu started to scream. Fourze and Yuki were trying out the switches. Miu tells Daimonji that Kamen Rider activities are important and hangs up the phone. Gentaro, Kengo and Yuki are requested to have a supplementary class during holiday time, but a Zodiarts appeared and the three must leave the classroom. The teacher ordered them to stand outside the classroom because of their actions. Daimonji is in the class as well so as to interfere with the Kamen Rider Club. Next, it’s been confirmed that anime singer May’N and former SURFACE vocalist Shiina Yoshiharu have formed a new singing unit, the Astronauts, to sing the theme for Fourze’s Elek State entitled “Giant Step”, which was heard in episode 6 of Fourze. Both artists have performed a number of different anime themes with each of their respective groups, and this is the first time the two have collaborated on such a project. 2nd Rider is named Kamen Rider Sagu and powers come from the Sagittarius Zodiarts. The Zodiarts Switch is converted into the 41st Astro Switch. Belt has a bow-and-arrow motif and works like GokaiSilver’s GokaiCellular, scanning the switches. The arrow on the belt is the symbol for Mars, the circle of the arrow is pulled up on using your finger to transform, causing the arrow to slide over the Switch, scanning it. Belt works with Sagu’s personal weapon. So, a bad guy turned good, and on based on the warrior constellation Sagittarius? We’ll have to see how this one turns out. And that’s it for Fourze news. You should be completely caught up at this point in time. But if anything else pops up, I’ll be sure to let you know! Author M.F. CalhounPosted on October 10, 2011 October 10, 2011 Categories MC's postsTags confirmation, Elek State, episode summaries, info, Kamen Rider Climax Heroes Fourze, Kamen Rider Fourze, Kamen Rider Sagu, Kamen Rider x Kamen Rider Fourze & OOO Movie Wars MEGAMAX, new rider, news, preview, rumors, the astronauts, theme song, trailerLeave a comment on Kamen Rider Fourze Super MEGA post: Launching Story Barrage in 3,…2,…1! This leaked magazine scan has revealed quite a lot about the upcoming game Kamen Rider Climax Heroes Fourze, mainly dealing with OOO, Birth, and a little more about Fourze. According to the scans, OOO will have all of his major Combos, including the movie-exclusive BuraKaWani, as well as having a medal swap system in place, giving him 127 possible Medal combinations. Both Kamen Rider Birth and Proto-Birth will be featured in the game. And it looks like Fourze will be able to use the #5 Magic Hands Switch in the game. No news on any other Switches or Modules that have made it into the game. Well, with all of this so far revealed, I wonder what other secrets will come out before the game’s release this December? Climax Heroes Fourze Update: Tag-Team Supreme! You can swap characters freely without consuming Gauge. You can call your assist to do combined attacks. For example, if you choose Faiz Blaster and Hyper Kabuto both of them can do a powerful missile attack. This consumes Rider Gauge. When it’s two-on-two on screen, you can swap between characters letting the CPU control the other one. The game comes out this winter for the PSP and Nintendo Wii for 5981 yen. Author M.F. CalhounPosted on September 25, 2011 Categories Who Knows, Who Cares?Tags Climax Heroes, features, info, Kamen Rider Climax Heroes Fourze, Kamen Rider Fourze, new, tag-team, update, video game1 Comment on Climax Heroes Fourze Update: Tag-Team Supreme! Climax Heroes Fourze Tag Team Preview: Kuuga Ultimate AND OOO PuToTyra ON THE SAME TEAM?! We’re doomed. The tag team system works similarly to games like Marvel vs. Capcom or Street Fighter X Tekken, where players can switch out between the two characters. There are a total of 40 playable characters (tie-in much? ), which includes a new host of Showa era Riders, and there are a total of 13 different stages to unlock and play through. Kamen Rider Climax Heroes Fourze will be released for the PSP and Wii this December for 5891 yen. Author M.F. CalhounPosted on September 18, 2011 Categories MC's postsTags Kamen Rider Climax Heroes Fourze, preview, tag-team, Tokyo Game Show, videoLeave a comment on Climax Heroes Fourze Tag Team Preview: Kuuga Ultimate AND OOO PuToTyra ON THE SAME TEAM?! We’re doomed. 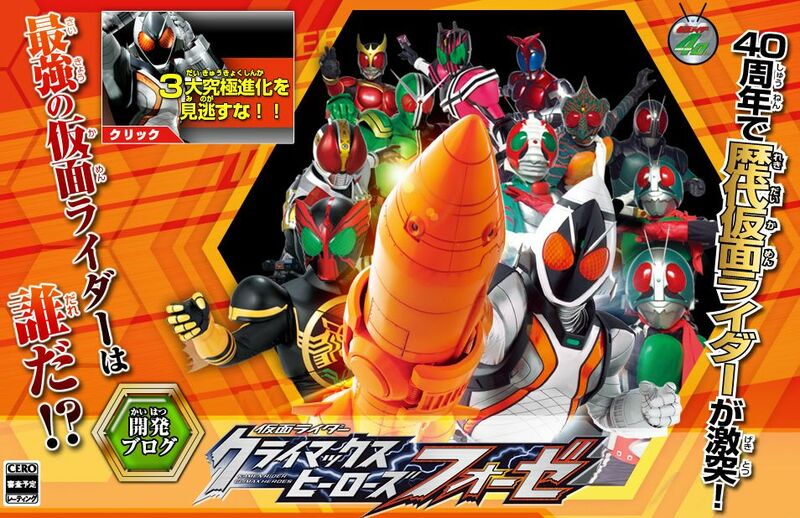 Climax Heroes Fourze Cover Art Revealed: Riders on Parade! Here’s the cover art for the upcoming Climax Heroes installment Kamen Rider Climax Heroes Fourze. The game itself comes out December 2011 for 5891 yen. What I would like to know is, why did they go with two different covers for the different versions of the game? Why not just stick with one or another? Anyway, what I really want to know is, which is your favorite? Do you prefer the PSP version’s cover art, or the Wii’s? From an artistic POV, I prefer the PSP version more, though from a marketing perspective, the Wii’s version get’s the point of the game across slightly better. What do you think? Author M.F. 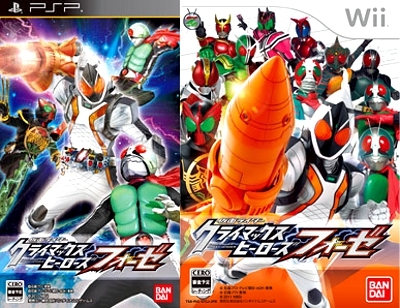 CalhounPosted on September 17, 2011 September 17, 2011 Categories MC's postsTags Climax Heroes, cover art, Kamen Rider, Kamen Rider Climax Heroes Fourze, Nintendo Wii, PSPLeave a comment on Climax Heroes Fourze Cover Art Revealed: Riders on Parade!